Author: Sawyer, Robert J. Set In . . . 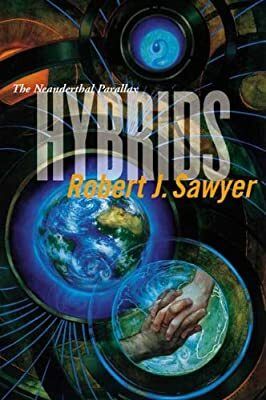 In Hominids, Nebula Award-winning author Robert J. Sawyer introduced a character readers will never forget: Ponter Boddit, a Neanderthal physicist from a parallel Earth who was whisked from his reality into ours by a quantum-computing experiment gone awry-making him the ultimate stranger in a strange land. In that book and in its sequel, Humans, Sawyer showed us the Neanderthal version of Earth in loving detail-a tour de force of world-building; a masterpiece of alternate history. Now, in Hybrids, Ponter Boddit and his Homo sapien lover, geneticist Mary Vaughan, are torn between two worlds, struggling to find a way to make their star-crossed relationship work. Aided by banned Neanderthal technology, they plan to conceive the first hybrid child, a symbol of hope for the joining of their two versions of reality. But after an experiment shows that Mary's religious faith--something completely absent in Neanderthals - is a quirk of the neurological wiring of Homo sapiens' brains, Ponter and Mary must decide whether their child should be predisposed to atheism or belief. Meanwhile, as Mary's Earth is dealing with a collapse of its planetary magnetic field, her boss, the enigmatic Jock Krieger, has turned envious eyes on the unspoiled Eden that is the Neanderthal world . . . .
Hybrids is filled to bursting with Sawyer's signature speculations about alternative ways of being human, exploding our preconceptions of morality and gender, of faith and love. His Neanderthal Parallax trilogy is a classic in the making, and here he brings it to a stunning, thought-provoking conclusion that's sure to make Hybrids one of the most controversial books of the year.